Fixed-point numbers are either unsigned or signed. Unsigned fixed-point numbers only represent positive values. Signed fixed-point numbers can represent both positive and negative values. 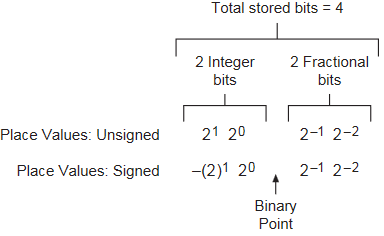 For signed fixed-point numbers, the leftmost bit of the stored set of bits determines if the value of the bits is positive or negative. If the first stored bit is 1, the value of the bits is negative. If the first stored bit is 0, the value of the bits is positive. LabVIEW interprets signed fixed-point numbers using an encoding called two's complement. The following image shows an example fixed-point number with two integer bits and two fractional bits. Notice that the exponents of all place values remain the same between signed and unsigned numbers, but in a signed fixed-point number, the value of the leftmost place is negative. LabVIEW defines the range of a fixed-point number as the set of values that a particular fixed-point data type can represent. To determine the range of a fixed-point number, you need to know the maximum and minimum values the number can represent, and the increment between each value. The increment between each value is also called the precision, or delta, of the fixed-point number.